Not talking Jeff Goldblum is so much more creepier than talking Jeff Goldblum. 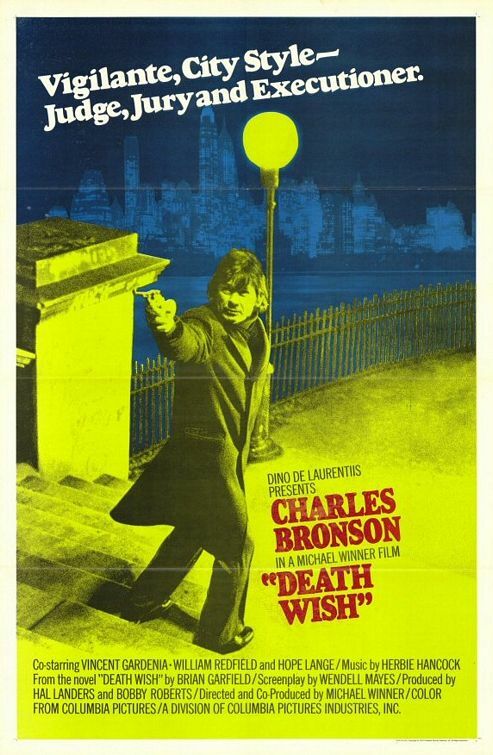 Death Wish, directed by Michael Winner, tells the story of a loving couple, played by Charles Bronson and Hope Lange. They have a daughter named Carol and a son-in-law named Jack. Bronson is Paul Kersey, a kind man who works as an architect and lives in the dirtier parts of New York City. Kersey is not a man of violence, but when three hooligans kill his wife and sexually assault his daughter, he decides to take on the streets his own way. The plot is as straight-forward as revenge films come; Guy and object of desire are happy, something bad happens to object of desire, guy decides to deal with it. In this case, it’s Paul Kersey and his wife and daughter. That may be sub-par for today’s standard of a good plot, but for 1974 times it was enough. It’s enough for me as well, as this kind of movie doesn’t need intricate stories or many characters, it just needs a solid lead to put ourselves in in our fantasies and some good action scenes. In both departments it delivers well. Charles Bronson is our main star as Paul Kersey, our family man turned vigilante. What I really like about Kersey how believable and slow he changes. Here’s a man who had everything he ever needed; a loving wife and a great daughter. If you suddenly had that taken from you, and the police could not help in any way, would you not feel just a tiny bit pissed off? And that’s not it. When he actually goes through his plan, he doesn’t just immediately become this dark knight of sorts, no. He actually pukes when he first commits murder, which is probably what most people will do if they did that. Director Michael Winner is…ok. He’s not a bad director, but nothing about him stands out. Well, perhaps this. He was able to make New York look like a much grimier and slick place, instead of the usual bright lights and stock tickers. The Big Apple is shown to have a sour side. Overall, Death Wish is a revenge flick that was well made and well acted, but doesn’t have much besides that. Watch it if you have the time. This entry was posted in Film, Movie, Review and tagged 1974, Charles Bronson, Death Wish, Hope Lange, Michael Winner, Review.